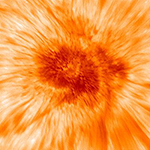 The magnetic field that covers the Sun and determines its behavior –the eleven year cycles no less than such conspicuous phenomena as solar spots and solar storms– also has another side to it: a magnetic web that covers the entire surface of the Sun at rest and whose net magnetic flow is greater than that of the active areas. A study led by the Institute of Astrophysics of Andalusia (IAA-CSIC) has revealed where the flow that feeds this web comes from. The outline of the solar magnetic web coincides with the boundaries of the so-called supergranules, structures linked to the existence of hot gas rising to the surface (similar to the bubbles made by boiling water) some twenty thousand kilometers in diameter. “We have discovered that inside these supergranules, in what is known as intranetwork, small magnetic elements appear which travel toward the outer boundaries and interact with the web”, says Milan Gosic, IAA researcher in charge of the study. As the sun skims through the galaxy, it flings out charged particles in a stream of plasma called the solar wind, and the solar wind creates a bubble extending far outside the solar system known as the heliosphere. For decades, scientists have visualized the heliosphere as shaped like a comet, with a very long tail extending thousands of times as far as the distance from the Earth to the sun. New research suggests that the sun’s magnetic field controls the large-scale shape of the heliosphere “much more than had been previously thought,” says Merav Opher, associate professor of astronomy and director of the Center for Space Physics at Boston University (BU). In the new model, the magnetic field squeezes the solar wind along the sun’s North and South axes, producing two jets that are then dragged downstream by the flow of the interstellar medium through which the heliosphere moves. Solar flares can release the energy equivalent of many atomic bombs, enough to cut out satellite communications and damage power grids on Earth, 93 million miles away. The flares arise from twisted magnetic fields that occur all over the sun’s surface, and they increase in frequency every 11 years, a cycle that is now at its maximum. 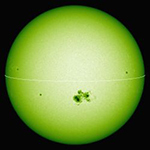 In the latter half of October, huge sunspots were observed on the surface of the Sun. These sunspots appeared at the east limb of the Sun on Oct. 16, and moved to the west as the Sun rotated. They rotated out of view after Oct. 30. On Oct. 26, the total area of these sunspots became almost 66 times larger than the Earth’s cross section. This was the largest sunspot area in this solar cycle, and the largest observed in the last 24 years (since Nov. 18, 1990). In the middle of November, these sunspots appeared again at the east limb, as the Sun’s rotation brought them back into view. UK scientists have unveiled a new £2.5 million (€3.2 million) project that will improve forecasts of solar storms, including their arrival time and impact on the Earth. 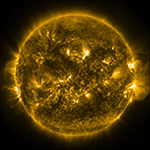 The three year project will provide the most comprehensive set of information to date about the Sun’s influence on interplanetary space and the effects space weather can have on the Earth. The project will enable governments to improve their strategies to lessen the potential negative impacts from the Sun.